Varadero because It is spectacularly beautiful and also I got married on it! Maldives. The water is gorgeous, warm and the beaches are powdery white and silky. Paradise Island – Bahamas. Gentle breezes p, crystal clear water, great atmosphere. I took a G Adventures tour though Thailand, we were fortunate enough to camp on Hong Island, which is uninhabited. It is open to the public as a park during the day but closed at night. The most amazing beaches ever, buts Mexico and the Caribbean to shame! There have been many but what comes to mind is Mykonos, Greece but Hawaii has always been a favourite – actually, Maui! Jamaica stayed in Ocho Rios – beautiful beach and crystal clear water which cooled you down when it was hot but not too cold that you could not get wet. I have not been to a lot of beaches. but Bavaro beach in Punta Cana was impressive. Turks and Caicos can’t beat the beaches and water there! Cayo Coco, Cuba – you can walk for miles and forget about your troubles, the people are so friendly and the drinks are cold – couldn’t ask for better! Whitehaven Beach – Whitsunday islands, Australia – 7 km of amazing white sand, azure blue water and almost no people. My favorite beach is in Florida. Although, there are many lovely beaches in the Caribbean, Florida beaches stretch for miles. Sunset Beach Oahu. Why? People, Scenery, Water, the drive there. Beaches in Aruba – beautiful crystal blue waters, clean and not too crowded. Anywhere on Grand Cayman – I have spent the last two weeks on Grand Cayman and every day is a new beach that is absolutely stunning and is truly breathtaking contrast between the sand and the ocean. Galion Beach, St Maaten. Great big and long swimming/wading beach, but there is an area of reeds full of marine life to explore. Zanzibar – east side. Softest and whitest sand in the world! Maui – so many beautiful sand beaches. Or rocky spots for great snorkeling. Boracay, Allan, Philippines – The breach stretches for miles and sand is so smooth and white that it feels like flour. The hotels and restaurants are right there and nightlife is great. Scuba diving iscdon close. Proximity to airport as well. Close to a church for Sunday Mass. Parrot Cay, Turks and Caicos – Beautiful and private and not too far from East Coast. St. Thomas. The beaches are beautiful soft sand with the bluest water. Most of the beaches in Exuma Bahamas are amazing. Clear water, warm water, beautiful white sand and not at all crowded ever! Harvest Cay in the Bahamas. This is a privately owned island and the beach was spectacular as well as the colour of the water. Morocco – largely undiscovered as a beach destination by North Americans, so it’s a new and exciting destination for my clients. My favorite beach is at Huntington Beach in California. I love the peer with the 50’s dinner and I love all of the discount shopping. The people there are friendly, the sun is warm, the horizon goes on forever and the beach is never crowded. Nassau has the clearest water and best beaches that I’ve ever seen. Paradise Island, Nassau. Clean, clear water and white sand. Also, Cable Beach in Nassau. Same reason. Placencia, BZ. safe, swimable, white sand and in a great country. Stretches of the Mayan Riviera where the beach has not been eroded by storms eg. at the Barcelo Mayan resorts. Cayo Santa Maria Cuba has the most beautiful beaches in the world. My favorite beach is on Koh Kood Island in Thailand…the water is so warm and clear, and the island is so quiet and remote and untouched. Aruba! Under the hurricane belt, warm turquoise waters. no big wave crashing. Beautiful beaches. Cayo Guillermo…hands down best. Powdery sand like flour and turquois blue water. Just stunning. Negril for its soft sand, long walking beach and calm waters! Seven Mile Beach in Grand Cayman, powder white sand where you can walk for miles. My grandparents had a condo on that beach and I grew up going every year as a child. Cook Islands because it is calm, relaxing, crystal clear, and warm. Green sand beaches & Black sand beaches in Hawaii. Something so different & incredible to see. Karon Beach in Thailand. I remember this pristine beach before the big hotels went in …so it will always be one of my favourites. Tahiti & Polynesian islands. Beautiful beaches as well as stunning sunsets and scenery. Turks & Caicos at Beaches was the best!!! It was so long and white, just loved it. Bora Bora – haven’t got there yet but from everything I have read and heard I must go check it out! Boracay. sugary white sandy beach. inexpensive meals and lively nightlife. Gall Face, Sri Lanka. Serene and whiter than white beaches. Baby Beach in Aruba because the water is so crystal clear and shallow for little kids. Jolly Beach, Antigua. Stunnig white sand, crystal clear water, sheltered cove. Tahiti they have the clearest water, beautiful white sand beaches everywhere. – Douglas Buck ON, Norwich Travel Service Ltd.
Bahamas. Way off beaten track, low crowds, deep and long. – Paul Nielsen ON, Paragon Travel Agency Ltd.
tough question, there are so many, Auitutaki was pretty spectacular!! perfect in every way! Cayo Largo Cuba. Safe, calm and warm. Perfect place to swim with kids. Whitehaven Beach Australia. It is to die for it has the softest white sand and the clearest warmest blue water I have ever seen. Half Moon Cay, Bahamas. Best white sands, clean, and safe. New Zealand…so many long beautiful beaches that are safe to swim in and not crowded. Abaco, Bahamas – Because the turquoise water with the colourful starfish. The beach houses with the fish-fries in the evenings after a day of Bone fishing. The beautiful golfing on the edge of the ocean. Peace! Faial Portugal – Private place, amazing view of Pico Island. Breath taking and different. Grace Bay Beach, Turks and Caicos because it’s the paradise in everyone’s dreams. Turks & Caicos – definitely the best, whitest, most powdery beach in the world..
La Digue Island in the Seychelles. The island is fairly remote, the water is crystal clear and there are lots of fish – if you don’t mind them nibbling on your toes! Negril many years ago when it was miles of sand ,now very overgrown. Most beautiful beaches are in South Africa. Pristine sand and no crowds! Nassau, Bahamas. Stunningly beautiful. Not overwhelmed by commercialism. Amazing people. The beach at Hilton Barbados facing the marina is a pretty beach with powdery white sand, crystal clear water, and gently lapping waves. It’s not the most magnificent beach ever, but it was one of the first beaches my husband and I spent time on together, just before the birth of our first child. It left such an impression that we took a photo of that beach to the hospital when I went into labour as something that I could focus on during the tough times! Juan Dolio Beach in SDQ. White sand, blue water and it rains very little. Easy to find a private spot to swim and relax. Maroma Beach , Mayan Riviera. the sand is so soft in your toes, and white . Seven Mile Beach, Grand Cayman. 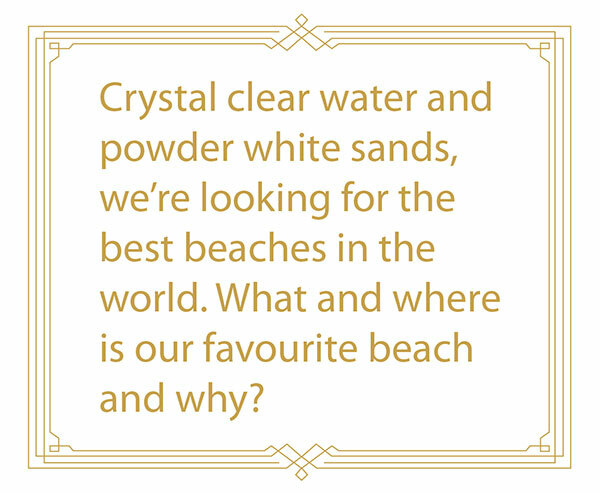 It has crystal clear waters and the sand is powdery soft. Varadero has really beautiful beaches with the clear water and the white sand. Cayo Santa Maria, Cuba – soft white sand and few people. Turks and Caicos in Provo, beautiful, pristine white sand with the bluest of blue water. The beach is 13 miles long. Punta Cana. Just gorgeous and clean beaches. You can see the sea life through the water so clearly. Beaches in Korcula, because everywhere on the Island they were so different, rocky, sandy but crystal clear waters. Jamaica, Sandals South Coast…pristine, long, white sand, clear, warm water, not busy. Cuba because they are the nicest I have seen and they have nobody hassle you on them for sales. Negril, perfect white sand beach, turqouise waters, miles of beach to walk on. Kaanapali Beach at Black Rock in Maui. Wide, gorgeous beach with fine sand, blue green water, calm bay to swim and fabulous snorkeling right there! Lots of sea turtles. Heaven on Earth. 7 mile beach Negril, Jamaica. Beautiful long beach. Caribbean Sea by my side! Hawaii, the big Island. Crystal clear water, powder white sands and black volcanic rock. Cuba – almost anywhere as you can walk for miles without worry of being stopped by sales people. Eagle Beach in Aruba. Beach is spotless, water so clear you can see all the marine life. It’s so fun when you have angel fish swimming up to you when you are in knee deep water. Bermuda – the sand is pink and the texture of baby powder. The Beach at Source D’Argent in the Seychelles Islands. Because it is in my country. – Flavie Grandcourt QC, Voyage Polar Bear Travels Inc.
Cayo Santa Maria, Cuba was the best beach I have been on. The sand was like baby powder. Unreal!